If ever there was a beer that successfully surrounded itself in its own mystique it must be Guinness. Few beers have endeared themselves so fully in the public's consciousness , built around cleverly designed marketing and ingenuity, producing a comforting familiarity over the annals of time. Yet it has often been its most simplistic of marketing techniques that have proved to be its most powerful tools. Even its origins are fact stranger than fiction when in 1759 Arthur Guinness purchased a run down brewery at St. James's Gate, Dublin for an annual rent of £45 per annum - on a 9000 year lease! Clearly he was confident of success and ready for 'Empire' building! Guinness's fame of course has been built around one beer type 'stout' ( and in so doing created the 'Irish dry stout' style) but it is the number of variations on that theme which make it interesting. 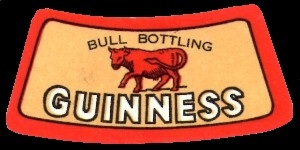 There is no such thing as one 'Guinness' although some (such as Original, Canned Draught etc..) are far more commonly available than others, and make up the bulk of its production. The more interesting products lay in other bottled forms, and beers such as Foreign Extra Stout, or FES, which was first produced on 1895 (and yet not 'officially' introduced to the UK market until 1994) have again defined a given style that many brewers globally have attempted to emulate. The one other Guinness that is perhaps the most fascinating, in more ways than one, is Guinness Special Export. Specifically produced for Anthony Martin in Belgium this still remains the oldest existing contract between Guinness and a supplier, dating back to 1911. Its origins go back to the founder of the company John Martin, who was a British brewer who settled in Antwerp. His philosophy was to sell beers of quality stating "Only connoisseurs can appreciate beers like mine" based no doubt on on the long tradition of high strength speciality brews that have always been a part of Belgium drinking culture. 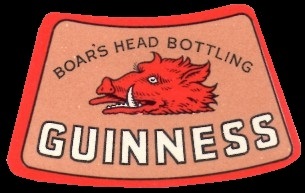 His request to Guinness was to produce a superior stout that would also find similar appreciation within the Belgium market, and although it has never officially been released in the Ireland or the UK, it can be found listed by several Independent retailers. Historically to it is probably the closest to the 'original' Guinness Stout made after 1820 in terms of style and strength (Arthur Guinness would have been producing a Brown Ale rather than a Porter up until this point). At 8% alc/vol. Special Export would have been regarded as typical 'Double' stout strength in the 19th Century, equating to the 'Dubble' of the Belgium breweries for example. Certainly stylistically too it is fuller and rounder than the Guinness FES, which is notably more hoppy, with an acidity more suited and designed for the warmer climes. On a marketing level too Guinness have often been at the forefront of innovation, and it has been suggested that John Martin was also responsible for launching the famous (and simplistic) slogan that became famous around the world "Guinness is good for you" although this would seem to be at odds with the story outlined by Brian Sibley in his book 'Guinness Advertising'. Before the days of heady ostentatious 'marketing analyses' it would seem the best way to get to the root of a matter was with a hands on approach! Oswald Greene and Bobby Bevan were both employed by the advertising agency S.H. Benson Ltd, who Guinness had entrusted with the task of carrying out their very first foray into advertising in the late 1920's. Both men took the logical approach that it was important to firstly find out why people actually drank Guinness, rather than formulate a campaign that could so easily miss the mark. For both Greene and Bevan 'market research' was largely confined to visiting pubs and asking customers why they actually drunk the stout? Time and again the reply would be the same "well it is good for you isn't it". So strong was this belief that both men felt they had been handed the answer and need not look any further for inspiration, and one of the most famous advertising slogans in the world was born! 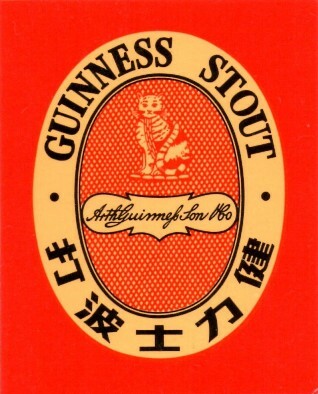 Further examples of the simplicity and originality Guinness would apply to a given problem manifest itself when Foreign Extra Stout was introduced to the Malaysian market as long ago as 1908. Aware of the fact that the local inhabitants may well have a problem with the English language, or be unable to pronounce the strange sounding name, it was decided to add an additional label for identification. These would take the form of 'animals' and each bottler of FES would use their own symbol. 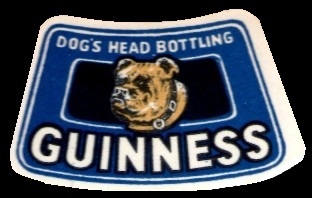 'Dogs Head' bottling for example was done by Messrs Read Bros. and Sime Darby, and other bottlers of Cat, Boar, Bull, Bulldog and Wolf, or 'Red Tongued Dog' (Ang Chee Cow in Malayan ) would similarly follow suite. The customer would simply therefore ask for the animal of his/her choice from the shelf! Guinness referred to these labels within the company as 'Chops' and they are strikingly attractive in design. 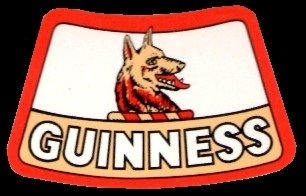 As with anything of this nature it seems certain labels took on more significance than others, and although the beer was the same in all 'Wolf' bottling (perhaps inevitably) seems to have become the dominant brand - having taken on a certain connection with sexual prowess! Abroad Guinness was often promoted in the past as being not only 'Good for you' but could offer vitality, strength, and virility into the bargain. This mystique need not be confined purely to consumption of the stout, but external use also, with the custom in the far east of new born babies being bathed in Guinness - to benefit from its 'strength' giving properties! Whilst only 250 years plus into his 9000 year lease Arthur Guinness would no doubt be happy with the progress made so far, and as the advert once famously said....'Any Time Is Guinness Time'....well, for the next 8700 years or so that is....at least!